When it comes to a luxurious budget hotel then Royal Trawas Hotel & Cottage is your perfect accomodation. Set amongst the beautiful part of Trawas, East Java and surrounded by pine forest and natural fresh air from the beautiful Mount Penanggungan makes Royal Trawas Hotel & Cottage is a smart choice while you are away from home. Strategically located at the heart of Trawas East Java, only 2 hours drive from Surabaya, within 5 minutes drive to Dlundung Waterfall, 15 minutes away to Kakek Bodo Waterfall and the ancient Hindi temple of Candi Jolotundo making Royal Trawas Hotel & Cottage one of the best choices of accommodation for your holiday near Surabaya. At Royal Trawas Hotel & Cottage, we ensure our guests with quality, comfort of convenience and friendly atmosphere. Royal Trawas Hotel & Cottage provides an excellent service that include free WiFi in public area, 24-hour front desk and room services, luggage storage and many more. Royal Trawas Hotel & Cottage facilities include, restaurants, bussiness center, meeting venue, outdoor pool and children playgroud makes our hotel ideal place for all families, groups or couples to create unforgettable memories. Start your perfect escape to an intimate and charming atmosphere with high quality comfort with Royal Trawas Hotel & Cottage. 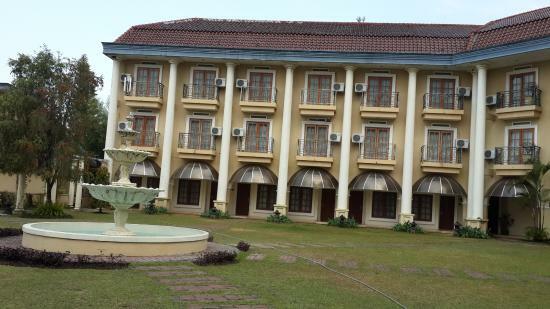 Welcome to Royal Trawas Hotel & Cottage!